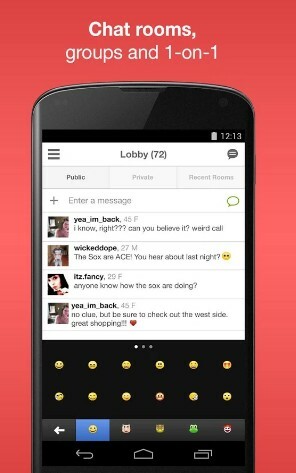 Hookup apps for Android are a new trend. We surely need that. Of course, we can’t go around and ask people for a date. Can we? So, a dating app or a website service helps to ease up the process. There’s no doubt that there are drawbacks. Also, you’ll find some of the users discouraging the use of a dating app. But, that’s another part of the story. Here, we will take a look at the positive side of dating service usefulness. In this article, we will take a look at some of the best hookup apps like Tinder. Do we need Alternative Apps Like Tinder? Also, if you take the details into account, some might be looking for a dating app with a better user interface, better matchmaking capability, or bearing in mind the price for a premium subscription (may be higher or lower). Drawbacks of using Tinder would not be a valid point to search for alternatives because every app available at the Play Store is not perfect. There’s always room for improvement. According to your personal preferences, you may choose an alternative that acts as the best hookup apps like Tinder. Now, let us move on taking a look at 11 of the best hookup apps like Tinder available at the Play Store. OkCupid is one of the best hookup apps that is similar to Tinder. It is a simple app with a good matchmaking ability where you either swipe left or right to show interest for someone. 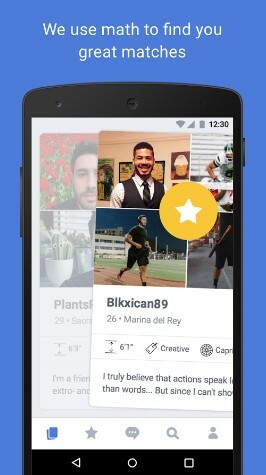 OkCupid offers decent user interfaces, and it is entirely free hookup app. Unlike some other dating apps (not shooting anyone specific! ), it does not charge you anything to be able to send a message to someone you like. It presents you several questions that you’ve to answer which then helps in enhancing the matchmaking process. 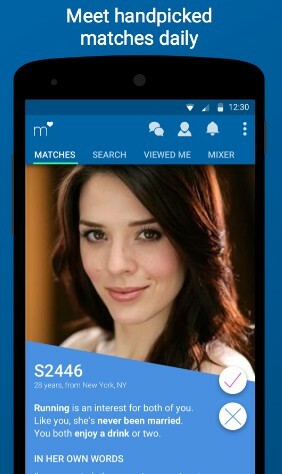 Match brings in an app for Android users. Well, Match.com is already a quite good dating web service, but now you’ve got a dating app to serve you with the right match. You can send a message to anyone you like. Unlike Tinder, you would observe more photos of local singles while you make use of it. Similar to Tinder, it lets you send a wink to show that you like them (a similar kind of thing exists on Tinder). It houses a big database of users who are on the lookout for the perfect one. Match.com also lets you experience the excitement on your Android Wear by supporting pulse notifications and making you have a conversation using voice commands. 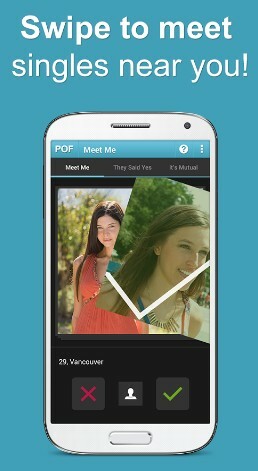 POF is an excellent free dating app available on the web. It is surely one of the best hookup app and alternatives to Tinder being yet another service from Tinder’s parent company. It lets you send messages for free and contains no hidden charges. Unquestionably, being one of the primary services from a company who owns Tinder, it has a lot of users. So, the probability of finding better match increases. Well, of course, some of the downsides with a lot of users come as well, i.e., more chances of fake profiles. It works similar to Tinder; you just have to swipe to show your interest. Hot or Not is an interesting hookup app like Tinder, that is available for Android. It is a game with a dating feature. Moreover, a game for fame to increase the possibility of getting a match quicker. If someone looks hot, he or she would trend nearby and be more likely to have a match with someone. 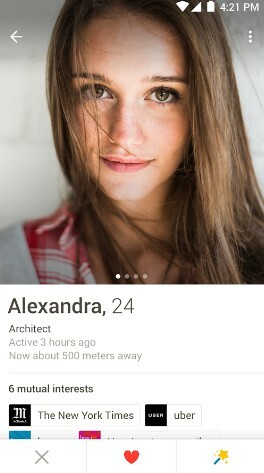 In either case, if you are the one, you will get a match insanely fast. Try your luck? Why not? Skout is an incredibly popular hookup app to meet new people. It is primarily not advertised as a hookup or dating app. But, you can choose to make either one. You’ll have your chances to get more friends from across the world using Skout, or you could also bump to a perfect match that you find suitable to ask for a date. You can search for people nearby as well. 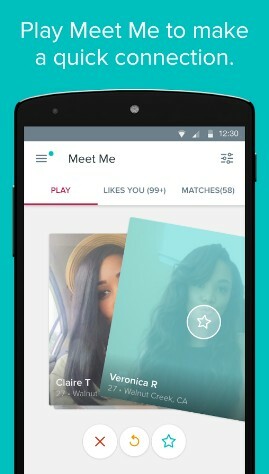 Tagged is yet another popular dating app for Android that strives to put the best for your match. Similar to POF, Tagged houses a lot of users. However, it is believed that Tagged offers more legitimate accounts compared to other hookup apps like Tinder. Although, you’re best to judge that! Happn is a unique hookup app that is quite popular as well. Unlike other dating apps like Tinder, Happn lets you meet the people that you have crossed paths with in real life. Of course, it detects the users participating in the service only. That’s definitely interesting! However, Happn does not let you start a conversation unless there’s a mutual like (crush). 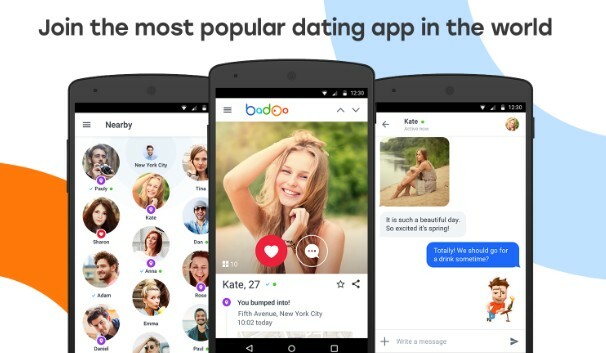 Badoo is a damn popular dating app. The number of users using the service alone makes it worth to be as one of the best hookup apps like Tinder available at the Play Store. It offers a decent user interface. Of course, the registration won’t cost you a dime nor searching for people would. However, you need to have credits (in-app purchases) if you want to feature your profile or enhance your reach within the hookup app. You will also be able to bump into people that you’ve met in real life. So, talking to them would be a charm! Also, if you are looking for a potential date nearby, you can search for that as well. 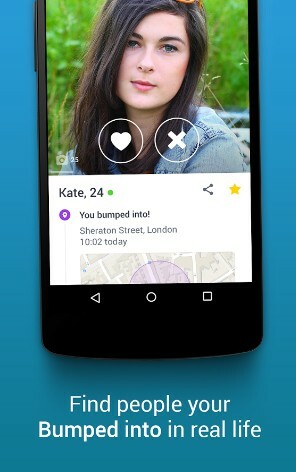 Moco is a great dating app like Tinder that a lot of users love (especially in the US). With Moco, you get the ability to utilize 1-to-1 conversation or group chats for free. The user interface is not much attractive but is quite easy-to-use. With Moco installed, you can search for a potential date nearby, or you could also filter your search results by gender preferences. 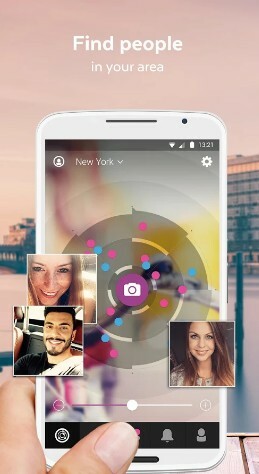 Lovoo being yet another popular dating app deserves its spot among the best hookup apps like Tinder available for Android. It definitely allows you to take advantage of the in-app purchases to give a boost to your profile. However, if you do not want a boost, you can keep trying on people you find, there’s no restriction for that. It’s completely free to chat with the one you show interest for. With Lovoo, you would have to play a game which accounts your likes and dislikes or mutual chats to find you the perfect one. It’s fun and definitely not rocket science! Coffee Meets Bagle takes an entirely different take than others. It realizes that swiping profiles (or with exhausted credits), your dating experience would be ruined. So, instead, you will be sent the perfect match for you once every day. The company claims to be careful while presenting a Bagle (a match) to you. Excited for everyday surprises without wasting much of your time? CMG’s for you! You’ve got swipes, premium subscriptions, free chat rooms, bagels every day and so on. What do you think you should go for? If you’re unsure about what you should go for, you’ll have to try them all to decide which one suits the best for your area and the type of matches you are looking for. Let us know your thoughts in the comments below. Also, if you got the perfect one while using any of the above-mentioned best hookup apps like Tinder, we’d love to hear about that! What is the Best Hair Styler App for Android to Try Different Hair Styles? Which are the Best Face Swap Apps for Android to Have Fun with Your Photos? How to Edit Photos Easily with the Best Photo Editing Apps for Android? What are the Best Karaoke Apps for Android that Make You Sound Good? What are the Best Selfie Camera Apps for Android to Help You Take Beautiful Selfies?